There are some terms about acrylic used by vendors that can mislead customers into thinking they are getting something they are not. A couple of these terms are "Museum Grade Acrylic" and "UV Stabilized Acrylic". These terms can lead customers to believe that they are getting actual TruVue Optium Museum Acrylic or acrylic with UV Protection. Neither of these claims is true. We consider Framing Grade Acrylics from Evonik or TruVue to be the best acrylic glazing products. Nothing else should be used to frame your art. Framing Grade Acrylic is acrylic that is manufactured specifically for the framing industry to provide the best clarity and protection for items that are framed and is manufactured to higher standards than other acrylic products. The major categories of Framing Grade Acrylic are : Premium Clear Acrylic (FF-3), Non-Glare Acrylic (P99), UV Protective Acrylic (OP3), UV/NG Acrylic (OP3P99) and TruVue Optium Museum Acrylic. Some Framing Grade Acrylic Info. FF3 and P99 block up to 66% of UV rays in the 300nm to 380 nm range. OP3 and OP3P99 block up to 99% of UV rays in the 300nm to 380 nm range. It should be noted that the UV protection in OP3 and OP3P99 is built into the acrylic and not a coating like cheaper products. Applied and spray on coating used by others doesn't provide the same long lasting protection. Framing Grade Acrylic is made by two manufacturers, Evonik (formerly Cyro) and TruVue. If you are unsure about the quality of the acrylic you are buying, ask for the manufacturer and type. If the manufacturer is Evonik or TruVue and the type is FF3, P99, OP3, OP3P99 or TruVue Optimum Museum Acrylic, then you are getting the best acrylic possible. It should be noted that Evonik also manufactures a number of other acrylic products used by other industries such as the sign industry and manufacturers of acrylic products. These are not manufactured to the same qualities as Framing Grade Acrylic. 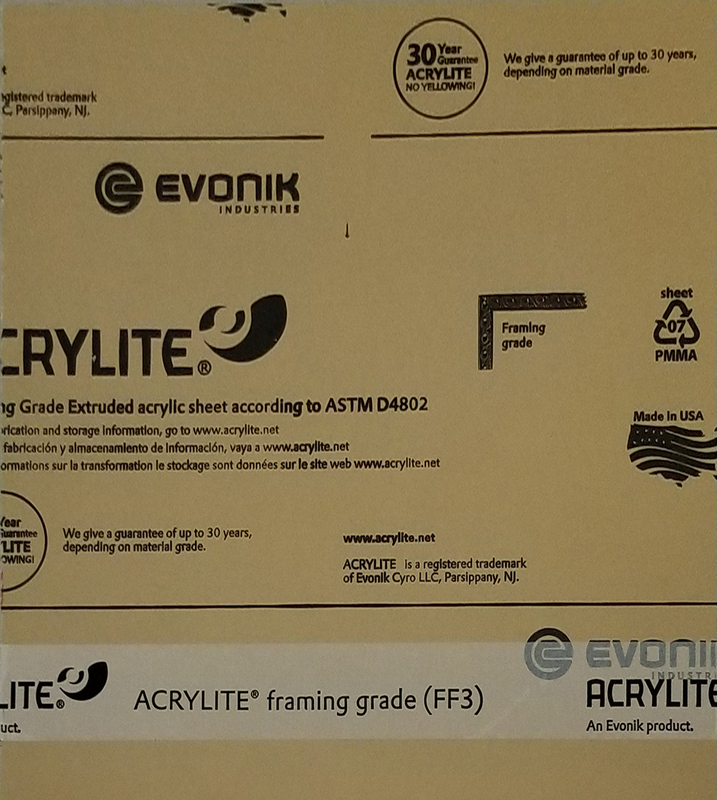 In my opinion, there is little difference between the Evonik and TruVue Framing Grade Acrylics. 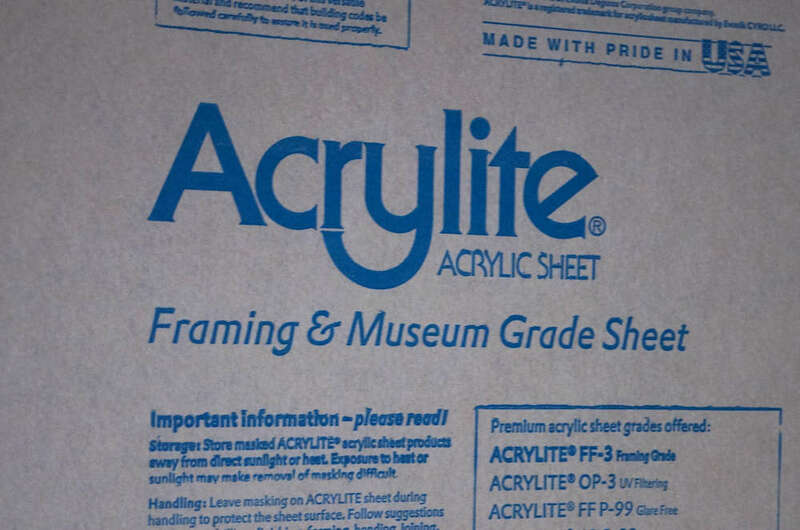 Before there was actual TruVue Optium Museum Acrylic, Evonik labeled its Acrylite acrylic sheet as "Framing And Museum Grade Sheet". So what is this? It is Framing Grade Acrylic. When TruVue Optium Museum Acrylic started being manufactured, Evonik no longer used this term. Now they use just "Framing Grade". So if a vendor is offering "Museum Grade Acrylic", what are you getting? The good news is that you are getting Framing Grade Acrylic that is suitable for the items you are framing. The bad news is that this obsolete term is misleading, leading you to believe that you are getting the very expensive TruVue Optium Museum Acrylic. If you aren't sure, ask the vendor exactly what you are getting; manufacturer and type. The only manufacturer of Optium Museum Acrylic is TruVue. If they say Evonik, then you will know something is wrong. The other indicator is cost. If they are offering Museum Grade Acrylic as an even-steven replacement for glass, that can't be right. In most cases real TruVue Optium Museum Acrylic will cost more than the frame. The first image on the right shows an older and obsolete Evonik label. The second image shows the current label. Museum Grade was deleted from the label and no longer used by Evonik. UV Stabilized Acrylic has nothing to do with UV Protection. If a vendor tells you that his acrylic is UV stabilized, ask what the UV Protection is. UV Stabilization and UV Protection have nothing to do with each other. UV Stabilization deals with the protection of the acrylic itself and UV Protection deals with the protection of the item being framed. All Framing Grade Acrylic (see above) is UV stabilized as is most non-Framing acrylic. The 'stabilized' term comes from the plastics industry to indicate that the acrylic itself won't fade, yellow or crack when left outside. Professional framers don't use this term, as they offer UV Protective Framing Grade Acrylic that also helps protect your art. It is never used in a framing context except to mislead you into believing that it is really UV protection. It isn't. Sign companies use it to indicate that their sign plastics will last outside. Furniture and other manufacturers of outside products also use this term. The best products for your framing are Framing Grade Acrylics from Evonik or TruVue. Nothing else should be used to frame your art.